Amatrol’s ET200S Stack Light Learning System (89-SLET200) connects to the 890- ET200SF’s Output Module and covers stack light function and operation in relation to safety PLC applications. Stack lights provide long distance indication of a machine or process’ operating state or condition. This visual, and sometimes audio, indicator allows for operators to quickly assess the problem and gives maintenance technicians information regarding the fault type. The 89-SLET200 includes a five segment stack light, a variable volume annunciator with bracket, a connecting cable, student curriculum, and an instructor’s guide. 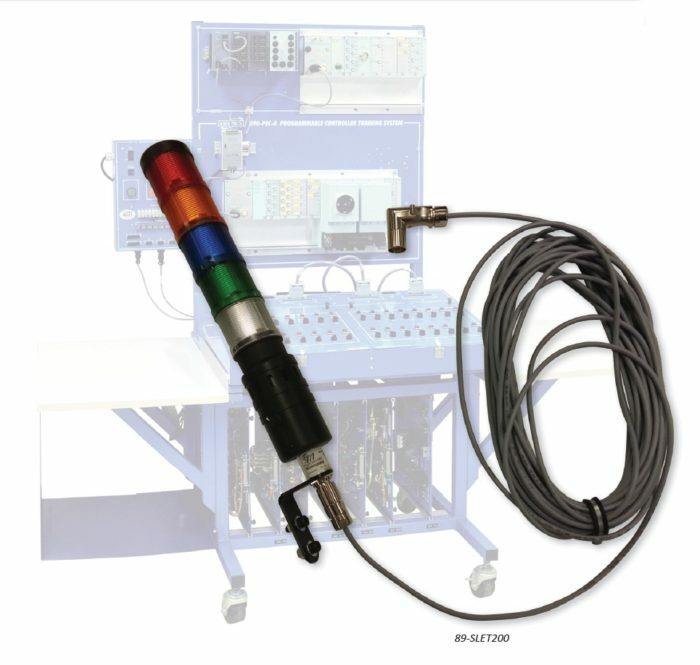 The 89-SLET200’s curriculum covers a variety of important learning topics including: the function of a stack light; Siemens 8WD44 signal column component identification; the function of the controller’s memory clock bits; stack light operation; and controlling a stack light by modifying a PLC program.